CashHopper: Guidelines to become successful at the PTC business!!! In this post I present to you some simple rules you need to keep in mind to become successful in the PTC business. You need to imbibe these rules and follow them to the tee to have any chance of making big in this business. 1. Click all your designated ads - EACH AND EVERY DAY. This is your daily bread and butter. Key words here are ALL and EVERY DAY. You cannot afford to miss a single day, especially if you have rented referrals. Bear in mind that you won't be paid your rented referral earnings if you do not click your portion of the ads for that day. SO DON'T STOP THAT CLICKING!!! 2. Have patience and discipline - Many first time PTC users get fed up after clicking ads for a day or two. They are all excited at signup and think this is some sort of get rich quick scheme. This is far from the truth. THE PTC BUSINESS IS NOT A GET RICH QUICK SCHEME. YOU CANNOT, AND WILL NOT, BECOME A MILLIONAIRE OVERNIGHT. PERIOD!!! Now read the above lines once again. Got that!!! You need patience and discipline to make money in this game. Patience to click ads everyday. Discipline not to withdraw funds as soon as they are available. Sure! A lot of newbies withdraw funds at the first available moment because they want to check the authenticity of the PTC. That is not wrong at all and that's where this blog will help you. The PTC's listed on this blog have been thoroughly researched and it is only fair to say that your money is safe. 3. Treat this as a business - There are thousands of people across the world who make a decent living off PTC sites. How you may ask?? The answer is very simple. They treat this as a business and not like any other past time. Just like you need to invest in your business, you need to invest time and some money in this. Now, you don't need to spend a dime from your pocket. You can invest the money you make by clicking ads to buy Upgrades which in turn help you make more money. You can also look at renting referrals. 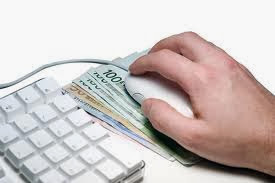 Money attracts money and that is as true for PTC sites as it is true for any other business. 4. Recycle your non performing Rented referrals - If you have rented referrals and they do not click, they are useless to you. In such cases look at recycling (delete and add a new one) them. Make sure that AutoPay is turned on. This way you will not pay extra to retain a referral in case they do not click. 5. Promote your referral link - Time and again I have mentioned on this blog that to make big money you need to have lot of Direct referrals. Active Direct referrals. Thats the key. The biggest advantage of Direct referrals is that they are absolutely free. So how do you get these Direct referrals to join under you. There are several ways to do this. For starters you could promote your link on Social Networking sites like Facebook, Twitter etc. For your benefit, I have compiled a referral guide which contains pointers on how to promote your link to the maximum audience possible. Do go through it here..
Bear in mind that we need ACTIVE DIRECT REFERRALS. Meaning they have to click ads everyday else we do not make any money. I know! I know! That is not in our hands. All we can do is hope and pray that most, if not all, of our Directs click. I am sure this article will motivate them to do so. After all, who doesn't want to earn some money from the comfort of their home. 6. Don't forget the offers, tasks and AdGrid - Yes! These 3 are most likely to augment your PTC earnings. I know that the AdGrid is a game of chance but what the heck! Doesn't hurt to try now does it?? Most sites will pay you anywhere between $5 to $10 for that one lucky click. So ensure you play the AdGrid wherever applicable. Don't forget to browse through the AdGrid Strategy guide I have prepared for you!! Now coming to the offers and tasks. These are simple and very easy to do so don't miss out on them. Clixsense has a weekly contest for completing tasks. The prize money of $100 is divided amongst the top 10 members. A collection of drops makes the ocean. Nowhere is this statement more true than in the PTC world!!! I think I have more or less listed all the important points you need to follow to be successful at this business. Go through each and every post of this blog and sign up to the PTC's. They are all genuine and consistently paying. This is an exciting world, a world where you can make a decent income sitting at home. Many long to have such a life, few accomplish it. Are you one of those? Only you can answer. It has been my endeavor, through this blog, to project and explain PTC sites as an alternative source of income. So go ahead, join me in becoming part of the PTC revolution.